Those with Number Four have a steadfast, stabilizing energy, and a great love for freedom of expression. Number Four brings good business insight with excellent managerial and organizational skills. These poeple tend to be pragmatic, which is a great strength. While they are hard working and efficient, they should be gracious toward others who are not as dedicated. 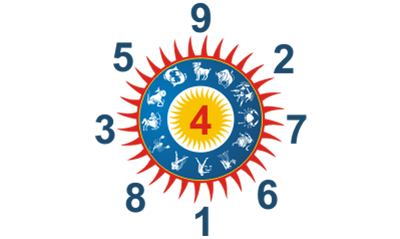 Those with Number Four have a steadying influence on others through their ability to maintain order and convention; however Number Four creates a tendency towards taking on the fears and worries of others. A good daily practice for those whose number is Four is to review the entire day at night, and give thanks for the gifts and blessings they have, whether large or small. They should appreciate and celebrate life. This positive, heart-felt outflow will help protect those with Number Four from their habit of worrying too much. This tendency should be conquered as it drains the energy needed for accomplishment. Number Four brings abilities for patience and detachment. Meditation will help keep their confidence and focus stable. These people are truly committed.